Single stage scale-like B or C powered rocket. Interesting Nosecone and expansion coupler. 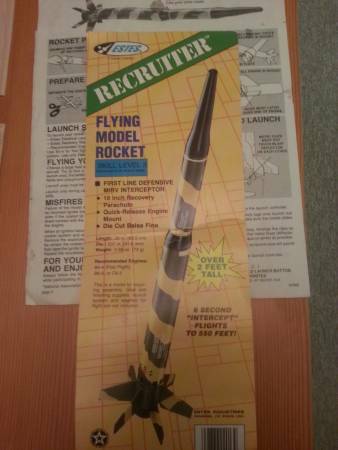 Has a faux rocket nozzle. I think the nosecone and coupler are the same as what the Estes "Beta" kit has. I built this when I was about 10 back in the '80s. Followed the instructions and it's still flying today. 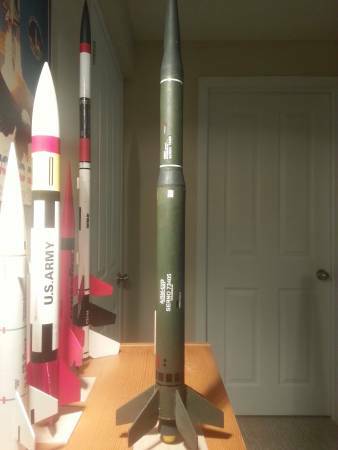 Well, I was 10, so it's brush painted with olive drab on the main tubes, the same as Rick Barne's Recruiter that I saw. The plastic bits are painted with German Grey. Flies straight every time, and not super high, but high enough. Mostly use C6-5 and estimate I am getting about 500 feet. B6-4 for a smaller area. The expansion joint, and small tube above with nosecone is what pops off for recovery. So the large tube means you always have lots of room for the 'chute etc. I have probably flown this around 40 times, no kidding, and only once had a failure to deploy. That caused a little damage on a tube, which was basically smoothed out and I kept flying it. Another failure was when the 30 year old shock cord snapped. Should have replaced that earlier. Oh, and I have lost many fins over the years, but actually still have some of the originals. Definitely been my most reliable rocket. Cool looking reliable rocket. My favourite rocket for sure. Except for a few fins, a shock cord and some ruban tape repairs it's all original with at least 40 flights on it.